Diamond Platnumz world is falling apart. Less than a month after admitting to father Hamisa Mobetto's child, the mother of his two children, Zari Hassan, has dumped him. The two have deleted each other's pics from their social media networks to confirm further that all is not well. He has disclosed on Instagram that his religion allows him up to four wives, but at 28, he is not yet married. 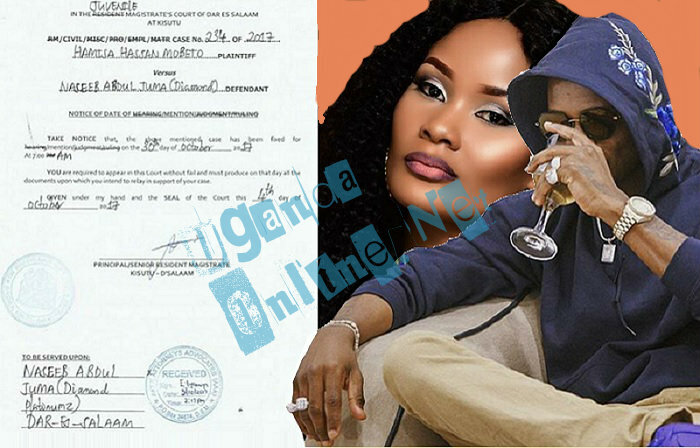 As he was busy deleting Zari's pics from his Instagram account, Hamisa Mobetto's lawyers slapped the singer with a court summon that requires him to appear in court on Oct 30, 2017. Hamisa is still fighting for her child. Just recently, when the Hallelujah singer was on Clouds FM, he revealed how he had given Hamisa a RAV4 ride and that he was taking care of his son, however, the latest developments indicate otherwise. Hamisa wants Diamond Platnumz to take care of her son the way he does for Zari's two children. Platnumz was today expected in Uganda at 11:00am, but the court issue and Zari dumping him has led to changes in his program. The Tanzanian singer will now arrive in the wee hours of Friday morning, to be exact 1:00am and perform at Kololo Independence grounds later in the day. The Wasafi records boss was supposed to have a press conference today at Serena hotel, but some insiders say, the adjustments in his program are aimed at him snubbing the many questions surrounding his love life currently. Zari has communicated that she won't be coming along, again, confirming that they are now worlds apart. "Well she should work hard on her career to be acknowledged worldwide. Than being called a baby mama from here and there who is next? Women we need to respect ourselves first if we need to be respected by others goes to both Hamisa and Zari they are just embarrassing themselves. Plus Diamond should respect himself and zip his pants if he doesn't want this kind of drama in his life, he should grow up as well. And for Hamisa if he wants Diamond to date her that won't happen we know were his heart belongs, " One wrote.